In an op-ed for The Washington Post, the US president’s son-in-law and Middle East advisor, Jared Kushner, specifically accused the Palestinian militant group Hamas of "producing misery for the people of Gaza." "[Middle East advisor Jared] Kushner and [special US representative for international negotiations Jason] Greenblatt are adopting the Israeli narrative, and their aggression against Hamas points to the contempt of the American government," Haaretz quoted Hamas spokesman Sami Abu Zuhri as saying. He referred to an op-ed published by The Washington Post and written by Kushner and Greenblatt in cooperation with US ambassador to Israel David Friedman, an article which Zuhri said shows that these American officials are "mere spokesmen for the Israeli occupation." In the op-ed, the three politicians singled out "the nightmare of Hamas's leadership," which they claimed "prolongs the suffering of the Palestinian people in Gaza." Urging the Palestinian militant group to recognize the state of Israel, the authors berated Hamas for "fighting a morally bankrupt, decades-old war that has long been lost." They also warned Hamas against using "rockets, mortars, terror tunnels, kite bombs and other weapons of aggression," which they said "lead only to stricter constraints on the people of Gaza." 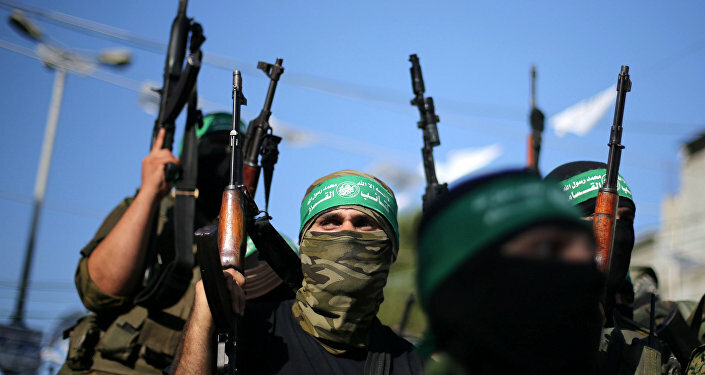 "Hamas's acts of aggression have only produced misery for the people of Gaza. The true victims of this terrible situation are the many Palestinians who are not rioting but whose futures are dimmed by Hamas's radical approach," Kushner, Greenblatt and Friedman claimed. The op-ed was published a few days after the Israel Defense Forces (IDF) hit more than 40 targets in the Gaza Strip in the most extensive daytime attack since 2014's Operation Protective Edge, in retaliation against recent attacks by Hamas, which had fired about 100 rockets and projectiles at southern Israel. Israeli Defense Minister Avigdor Lieberman has warned that Hamas will "pay [a] heavy price" if it does not cease hostilities. Israel's prime minister, Benjamin Netanyahu, for his part, stated that Hamas had been hit "substantially and hard," pledging that the Palestinian militants would suffer consequences for attacking Israel. The situation along the Israel-Gaza border has significantly deteriorated since late March, when a rally called the "Great March of Return" began on the border. At the time, Palestinian protesters started to claim the right of return for Palestinians displaced during the war that followed Israel's creation in 1948. During the riots, Palestinians had used balloons and kites to drop incendiaries on Israeli territory. In response, the Israeli military had used lethal force to suppress the rallies, citing security concerns and putting the blame for the escalation on Hamas. Israelis and Palestinians have been in conflict for decades as Palestine has been seeking diplomatic recognition of its independent state on the territories of the West Bank, including East Jerusalem, which is partially occupied by Israel, and the Gaza Strip. The Israeli government, alongside an array of other countries, refuses to recognize Palestine as an independent political and diplomatic entity, continuing to build settlements in occupied areas despite objections from the UN.